Welcome to the Web home of the Windsor Marksmen’s Association, Inc. Scroll down on this page to see information on Club news, events and match schedules. This organization has been in existence since early 1960. 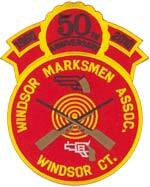 The Windsor Marksmen’s Association was established by a few local sportsmen for the purpose of organizing and establishing a recreational firearms shooting organization. The club had an initial membership of about 20 members but has since grown to a membership of over 200 members without regard to race, creed, ethnic background, gender or shooting ability.